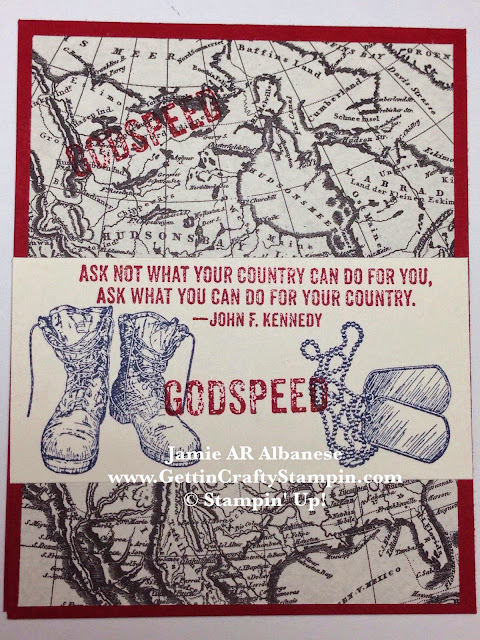 Honor our flag, soldiers and the 4th of July with this quick, vintage hand-stamped card. With our freedom comes a blessing of those who sacrificed so much for our way of life. 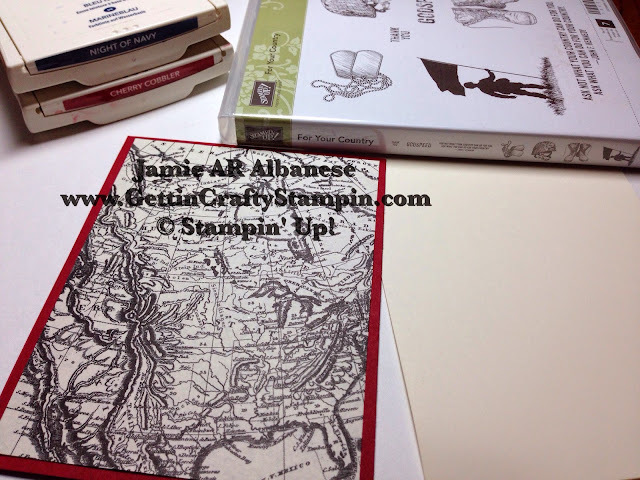 I hope you enjoy this vintage, map, hand-stamped soldier card. If you enjoy this tip and want to have some fun crafting with me, CLICK HERE and RSVP ASAP for my Upcoming Classes!! Most classes are FREE with a qualified purchase!! YES! 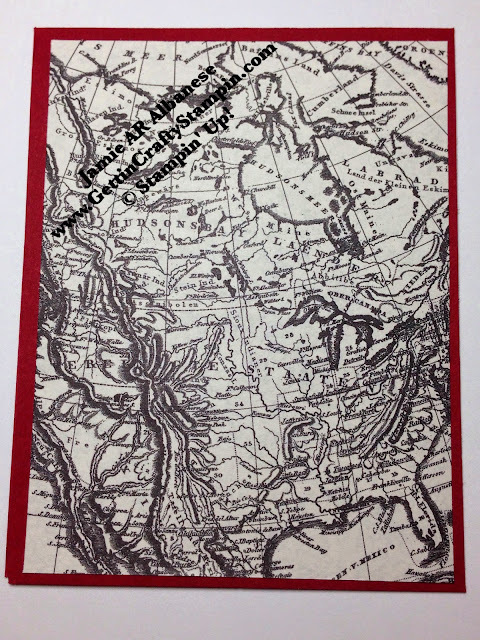 This is actually a vintage map of the United States of America from the Typeset Designer Series Paper. You can even see the Hudson Bay and more American landmarks! Cutting this paper down to highlight the USA was a great accent for this Patriotic Soldier Card. Layered over the Cherry Cobbler card stock for an additional depth of color and vintage look. The Color Coach pairs together the Cherry Cobbler and Night of Navy for a stunning look. Stamping these soldier's boots and dog tags from the For Your Country stamp set in the Night of Navy ink creates a lovely deep look. 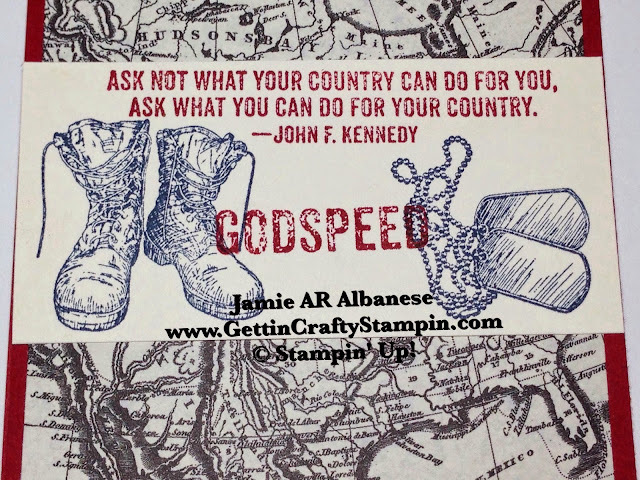 Stamping these sentiments from the For Your Country stamp set in the Cherry Cobbler is a great nod to our Old Glory flag and our amazing Soldiers who have sacrificed, so much, for our freedom. May ALL of our soldiers be safe and make it home to their loved ones.... they are true heroes. Nothing is more patriotic than to honor our soldiers and our great land. This vintage map, deep colored, hand-stamped soldier card is perfect to honor on this Independence Day! Happy 4th of July - I hope that you are blessed by family and friends and that this card warms your heart! !